Maud has dementia, meaning she doesn’t always know where or when she is, what she is doing, has just done or is supposed to do. Her life is full of her carers and daughter telling her things she can’t remember, what not to eat, where not to go, what not to buy and who not to call. There are a lot of nots and they all seem to result in Maud being mainly at home, on her own. To try and help her, she has notes stuck to walls, doors, shelves, reminders of how to take care of herself. Notes lie in stacks on the table and fill her pockets and handbag. They don’t seem to do much to help. They might, if she could remember when she had written them and if they were still relevant. 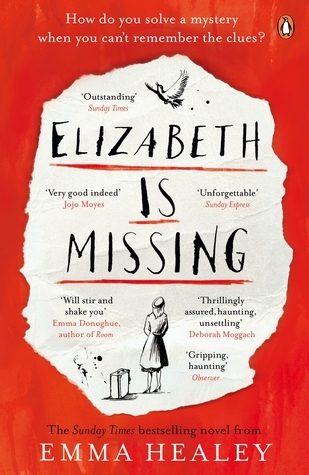 One note she knows is still relevant, is the one that tells her her best friend, Elizabeth, is missing. Elizabeth is the only person who makes her feel normal, despite her illness. Maud hasn’t seen her in a long time, although she isn’t sure how long, and is convinced Elizabeth’s no good son is most likely responsible. A fact confirmed when she finds Elizabeth’s house is empty. A house she can’t stop going back to. The problem is no one believes her, worse they don’t listen to her when she tries to tell them. Instead, they brush her off or humour her, depending on who “they” are – her daughter, her carer, the son, the police. Maud refuses to let go of Elizabeth though, determined to discover the truth. It’s hard, though, when she doesn’t know when she last saw her best friend and only remembers she is missing or what she’s done about it when she finds a note. This means she does a lot of the same things, like visiting the police station to file a report, again and again. Whilst Maud’s grasp of the present is fleeting, her past seems to be becoming clearer and clearer, especially memories of her sister Sukie who, like Elizabeth, went missing not long after the end of the war. She was never found but, now, Maud starts to unravel what might have happened to her. Emma Healey does a great job of moving between past and present and of creating the two worlds Maud inhabits, the clarity of her youth and the muddle of her old age. For me, this mix of the then and the now, make Maud a really rounded character. I felt I got to know her a little better with each chapter and care for her more with each page. I thought Emma Healey presented Maud and how her illness affected her and her family sympathetically without over sentimentalising. I liked, for example, that her daughter was caring but that she was obviously stressed by being the primary carer and sometimes snapped and that we got a glimpse of how frustrated Maud felt. I can’t imagine what it must be like to have dementia or be a carer but I do think I got a window into that world. As well as good characters, I found the book to be well written and compelling and an excellent debut. It wasn’t the most difficult mystery to solve, there weren’t the red herrings and twists you would find in crime fiction, but I don’t think it was meant to be. For me, this was more about the people, and family, and loss and it didn’t take a step wrong. Really, really liked it and a recommended read. This book has been on my TBR for awhile so I was really glad to see this review. I’m glad to know going on that the mystery isn’t the strong point. I look forward to reading this one. Great review! Thank you. I really hope you enjoy it. With Maud as the central character it was something different and so well done. I thoroughly enjoyed it too, I even recommended it to my mum who also enjoyed it. Yours was one of the reviews that made me pick up the book so thank you. I have this on my kindle and hope to read it soon. Glad you liked it!